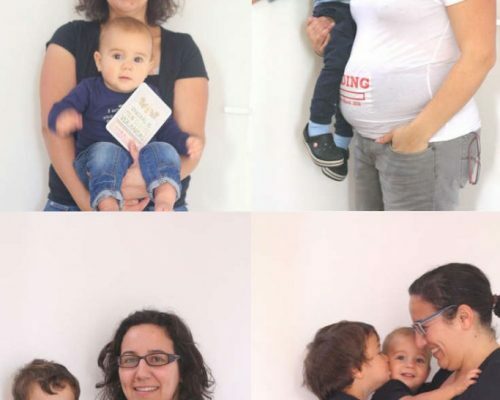 Having a baby means a first time for everything: the first time your baby smiles, the first time he sit down, the first time you take him on holidays,… As flying is nowadays very common, there will be also a first time for flying with a baby. As a first time you want to be prepared and have the best flight/journey possible. 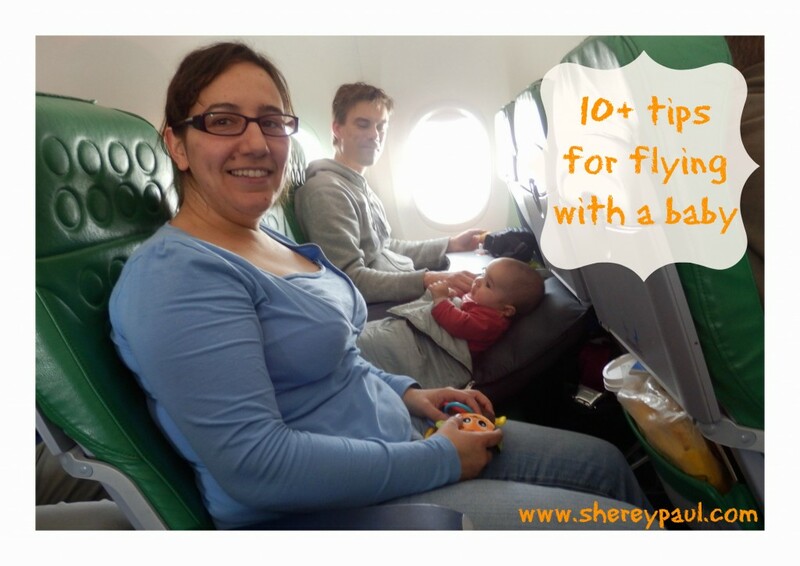 Here are some tips for flying with a baby. Some of them are specially indicated for a baby up to 6 months. But how do you adjust to the needs of your baby and still have the holidays you love? Babies need rest, food and lots of love. So when booking your flight take into consideration the sleep times of your baby and try to plan around it: avoid very early or night flights. Night rest is very important and even though your baby will (most probably) sleep again in the airplane, he will wake up during take off and landing as he has to seat on your lap looking forward during those times. So not so nice to break his sleep. Also plan enough time to get to the airport/home. A baby is not an adult and you might need to take a break. Talking about “poop accidents”, change his diaper before boarding the plane and between two flights. The airplanes have a changing table in the bathroom, but it’s very narrow and not so comfortable to use (also very hard). Dress your baby with comfortable and easy to change cloths. Some will think now, and what about baby food? Well, if you still have the chance, breast feed your baby as long as you can. Why? Simple, breast feeding can be the main food for a baby up to 1 year. Of course your baby will need some extra food from 6 months onward, but the breast is still the main source of energy and it’s always “ready”. In a airplane you don’t have everything and if you feed your baby with a bottle, you will need to carry bottle(s), milk powder, (hot) mineral water and any other stuff. A pacifier or bottle with water is also handy to let your baby drink during take off and landing, it will avoid the pain in his ears. If your baby is not very old and the flight is a medium-haul one, you could also take an inflatable bed for in the airplane (I have a post about it coming soon). This is handy if you have an extra free seat next to you. Also take your baby’s favorite toy, he will have something to play instead of trying to chew on the seat belt or the tray table ;). 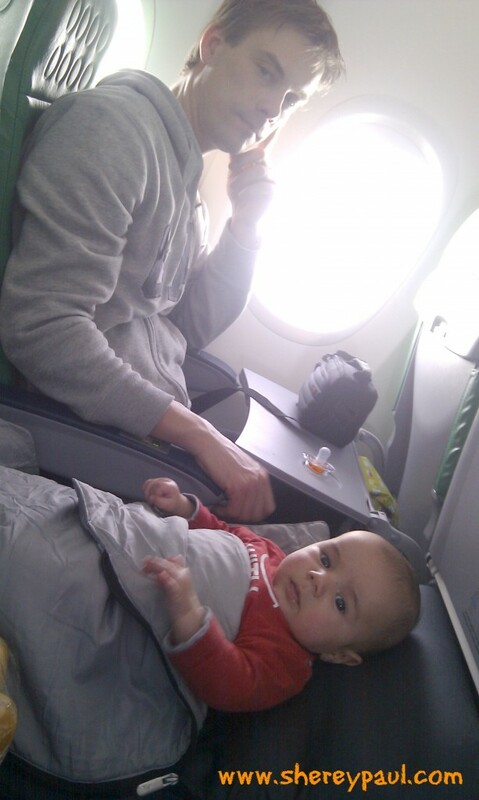 When I fly on my own with Liam, I prefer to seat in the last row of the plane because you can ask for help to the stewardess, you can go easily to the bathroom and when the other passengers board the plane, you won’t have the risk that someone passing by will hit or drop something on you (or the baby). Also after landing and taxing (when the plane already stopped), you can stand up and go to the stewardess area in order to avoid the hassle of people wanted to go out of the plane. So yes, normally I board the plane the first and go out as last. And last but not least, take a lot of patience and try to relax, you are going on holidays!! What are your tips and tricks for flying with a baby? 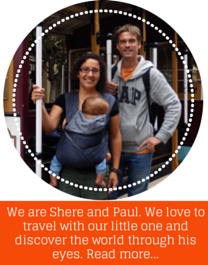 And if you don’t have a baby (yet), will you keep traveling once you have one? 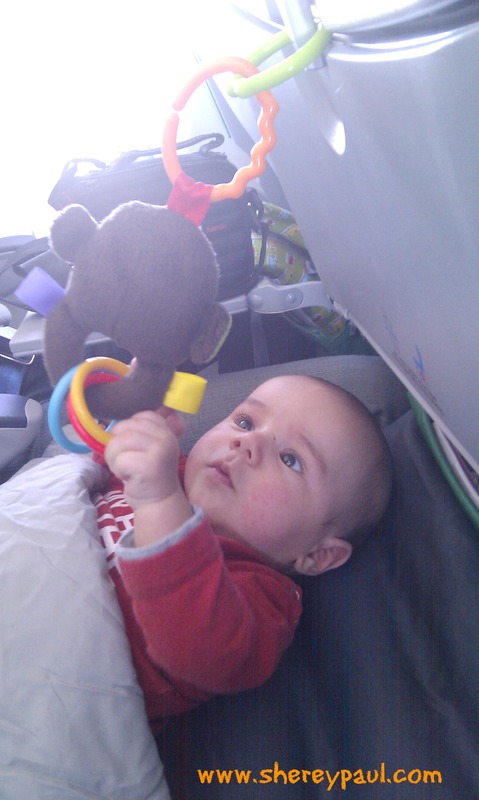 We took our baby traveling from a pretty young age as well. I have never seen an inflatable bed before, what a great idea. We took our oldest on a cruise when she was six months old. I think cruise are great for travelling with children/baby, they can move around and you don’t have the restrictions of a car. Great tips..We traveled with my daughter when she was only a few months old. It was quite challenging trying to keep her calm during the flight. After a few trips we got the hang of it. Thanks for linking up this week to #Weekendwanderlust. The first time you flight is always challenging, Liam was 8 weeks when he flew for the first time. Amazingly we managed very well. Fantastic tips! I don’t have any kids but I can imagine that you would want to be prepared as much as possible! Thank you so much for linking up with us at #WeekendWanderlust! Great tips and such a cute bubba! 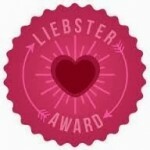 Discovered your blog via Wanderlust link up! We travel with three kids and have recently been around Europe for six weeks. Thanks for the visit! I guess that with three kids you will need a lot of organization in a trip, won’t you? I believe children can learn more travelling than at some schools. I love this article. I don’t have a baby myself but in Poland where I come from a lot of young parents including my friends seem to think that having a child means the end of traveling for at least ten years. I can’t disagree more and I really like how you cover this topic. I also know parents that think that way and I love to prove them that travelling with children is fun. Great post! I always feel so sorry for the poor bubs when the plane starts it’s decent and it starts hurting their ears I know how painful it can be as an adult and image it to be worse for them. Great tips! I don’t have a baby, but I can definitely see how helpful these would be. Neat to see what’s out there on the baby carrier market. the baby products market is huge, you find things you won’t think would exits. I think I’ll write a post about baby carriers because there’re many kinds but not all of them are good for the baby. When I was pregnant, I bought a carrier and later realized how bad it was. I’ve worried about traveling with a small baby and thought I’d have to give it up for a few years. These are excellent points to keep in mind, especially had the checked stroller. 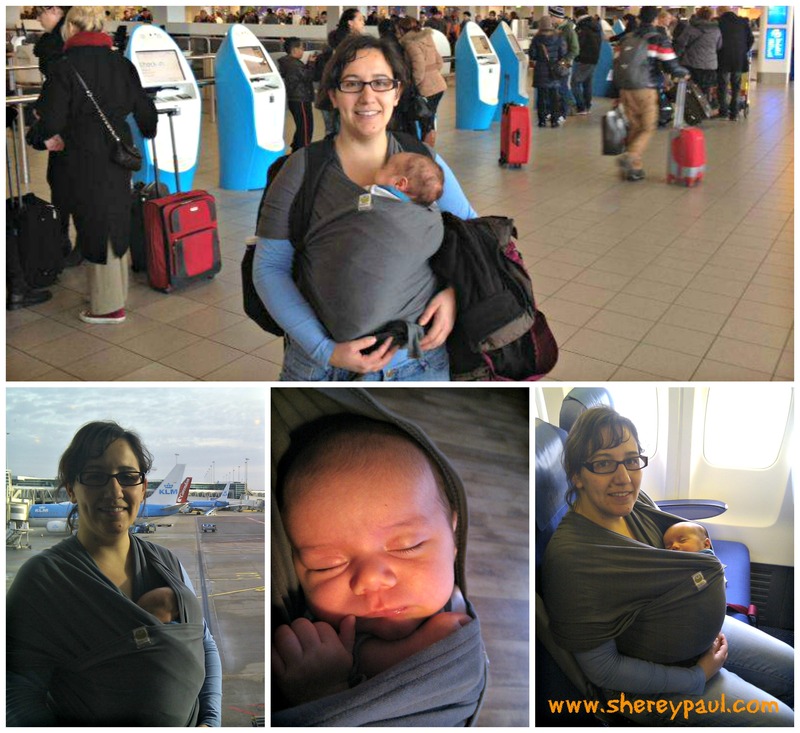 Breastfeeding my boys for as long as I did saved me so many times when we were travelling. It was the easiest way to get them to sleep, keep them calm and reduce ear popping issues when the plane was landing. 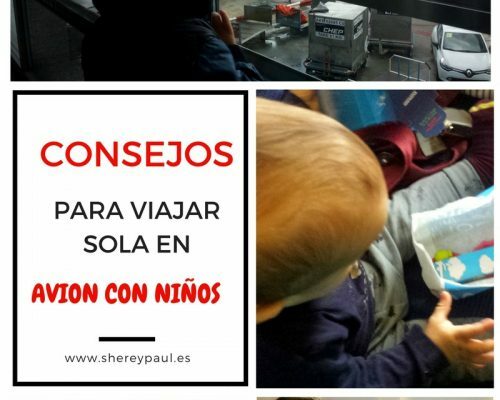 entré a leer porque en unos meses cruzamos océano con nuestro bebé que tendrá nueve meses por ese tiempo y necesitaba esa información. Muchas gracias! Cuando necesites una bloguer española para algo, cuenta conmigo. Un saludo y un besito a tu bebé… es precioso! gracias Noelia y buen viaje!